What is Spin Sauce? Halal chicken plates are known for a white sauce that’s tangy and creamy, swirled on top of the chicken and rice. White Spin Sauce is tangy with a background note of dill, something Rasoully says allows the sauce to be super versatile. The chicken and rice concept pioneered by entrepreneurial alum. 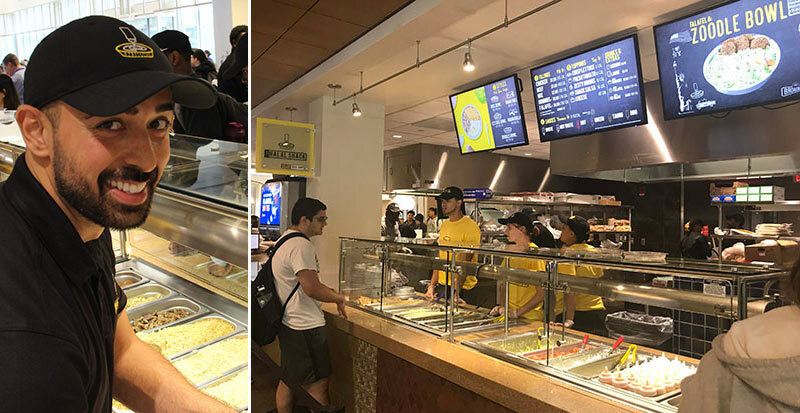 A new campus center, an entrepreneurial alum and dining services at SUNY Albany have come together this school year to bring students one of New York City’s most beloved street foods: halal chicken. The Halal Shack concept began with a condiment called Spin Sauce. The sauce was created by Jamal Rasoully, an alumni of SUNY Albany whose family is in the restaurant business. Last winter, Rasoully reached out to Steve Pearse, executive director of auxiliary services, about offering his Spin Sauce at campus dining venues. Pearse ended up offering Rasoully much more than an opportunity to sell sauce: a new concept in the eastern addition of the remodeled Campus Center. Jamal Rasoully developed Spin Sauce while he was a student at SUNY Albany. Now he’s back to serve the campus community with his own concept. With Rasoully’s background (and day job) in marketing, he was able to come up with the cool look and feel of the concept. The food at Halal Shack is a style that Rasoully calls “American Halal,” an amalgam of Mediterranean flavors, savory Middle Eastern spices and classic American style. Rasoully grew up in Queens, N.Y., after his family fled Afghanistan during the Soviet invasion. Over the years, his father owned and operated many restaurants, most with a Middle Eastern flavor. 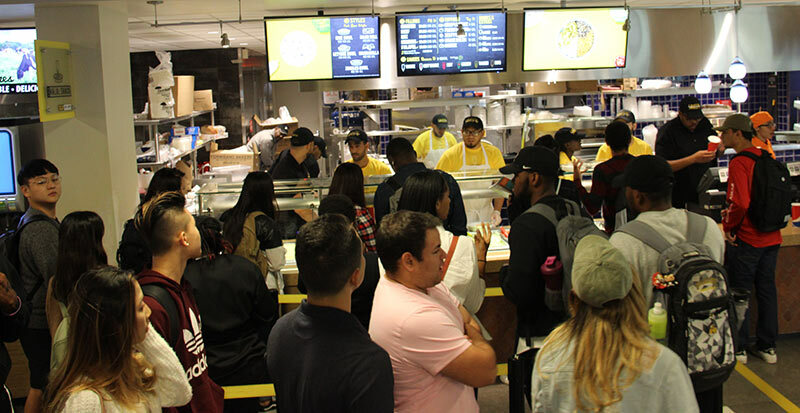 Halal Shack has been a hit with students since its soft opening at the start of the school year. “The most popular thing we tried is chicken,” Rasoully says. And at the heart of his new concept—the big differentiator—is the sauce, he says. “I had a vision…I’d seen the success of other halal chicken concepts, but their biggest downfall was that they didn’t have a good white sauce,” Rasoully says. While at college at SUNY Albany, he started bottling his sauces and bartering with his friends “for homework help,” he recalls. Eventually, Spin Sauce (available now in six flavors) caught on in a major way, getting featured in The New York Times and selling like crazy on Amazon. At Halal Shack, menu items begin with customers choosing a style: rice bowl, lettuce bowl, naan roll, “naan-adilla” and another option that Pearse came up with: zucchini noodles (aka zoodles). Then that vehicle is topped with succulent marinated chicken and a choice of sauces. Students have embraced the concept, lining up in big numbers ever since the recent soft opening. And Rasoully wants to serve the campus community of his alma mater in another way: He hopes to eventually mentor business and marketing students through Halal Shack.